How do I view events related to a campaign, ad, or ad group? To see all the events that have taken place with your account over the last two days, go to the Summary screen and tap New notifications. Tap an event in your feed to go to the related campaign, ad, or keyword. For the “Funds exhausted” and “Account is low on funds” events, you will be transferred to the payment screen. For the “Change in position” event, you will be transferred to a screen that functions similarly to the Bid Wizard (where you can adjust your CPC for the displaced keywords). To hide certain events from your feed, tap . Uncheck the notification types that you do not want to display in your feed and tap Done. 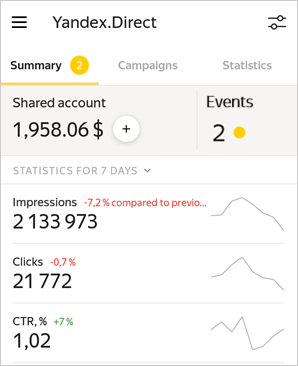 Tap Events on the campaign, ad, or ad-group screen. You can enable or disable push notifications in your device's settings. To open the settings, go to the Profile screen and tap Push notifications. On the settings screen, select the notification frequency and choose which events you want to get notifications about. Where can I see all events?How do I view events related to a campaign, ad, or ad group?How can I get push notifications?How do I set up push notifications?